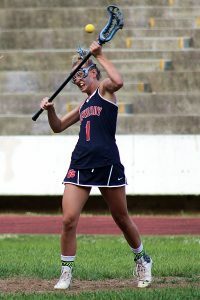 The Dunwoody girls’ and boys’ lacrosse teams made history as the first DeKalb County squads to make the playoffs, but the trip was short-lived as both fell in their opening round games of the Class 6A-7A state playoffs. The Lady Wildcats won six of their last seven regular season games to reach the state playoffs, including the playoff clinching 19-2 victory over Meadowcreek, to earn the No. 4 seed and face No. 1 seed Milton in the first round. The Milton playoff experience showed as the Lady Wildcats fell 9-1 to end their historic season at 9-7. Dunwoody managed just three shots on goal, all by senior Kate Snyder, who scored her team’s only goal of the game. Senior Jenna Hogan won seven face-offs in the game for Dunwoody. The Lady Wildcats are the first girls’ team to reach the state playoffs from DCSD and had the honor of being the first team to play. The Dunwoody Wildcats won eight of their last nine games to put together a 12-5 record and earn the No. 3 seed out of Area 7-6A-7A to become the first boys’ team from DCSD to reach the state playoffs. A playoff clinching 17-0 win over Mays and a 17-4 victory over Martin Luther King Jr. secured the No. 3 seed and a trip to face West Forsyth in the opening round of the Class 6A-7A state playoffs. It was the second meeting of the season for Dunwoody and West Forsyth with West Forsyth having won the regular season game. It was all West Forsyth in a 15-0 victory to eliminate the Wildcats who finished 12-6 overall. Dunwoody was limited to nine shots on goal led by David Wachtel with 3 and Durham Wysocki with 2. Goalie Adam Hydrick was under pressure throughout the game and made 13 saves.